The Legend of Zelda: A Link to the Past for Game Boy Advance (GBA) is a must-have for all Legend of Zelda fans. It is a retelling of everyone’s favorite classic Super Nintendo Entertainment System (SNES) role-playing game with a new multiplayer mode. It blends past and present game technology in the masterful way that only Nintendo can. This game retains the original SNES version's aerial fighting perspective. The game's superior graphics enhance the aesthetics, and more conquest goodies increase player satisfaction. This game features two games in one. You can start by playing A Link to the Past in the classic single player mode. Follow Link as he receives a telepathic message from the princess asking him for his help. This quest will lead Link into twisting mazes, dungeons, palaces, and dark forests. He will travel between the light world and the dark world searching for the Master Sword. His goal is to defeat Ganon and bring peace to the land of Hyrule. 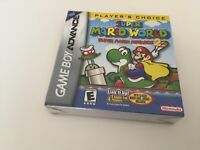 Clutch your GBA tightly as you traverse a scary dungeon in Hyrule castle and battle gruesome monsters. As you embark on your quest to save Princess Zelda and the kingdom, you will be faced with mind-bending challenges. Use your thinking cap to solve the many puzzles laid out by the cunning and murderous wizard, Agahnim. Before putting it down, save your game's progress using a battery backup and continue the adventure later on. Take up your sword to slash and dash your way to becoming a true hero. Once you have mastered A Link to the Past, you will be ready for the all-new multiplayer adventure, The Four Swords. The multiplayer mode can be accessed by up to four Game Boy Advance players. You will need to use a Game Link Cable and the same cartridge. In The Four Swords, two to four players take on the roles of young adventurers. They are on an epic quest from the Triforce. These adventurers brave the dangers of multiple dungeons and reclaim the Master Sword. You will have to draw your swords and work together with the other players to solve puzzles, defeat monsters, and overcome obstacles. Players will also be competing to see who can collect the most Rupees and finish with the highest score. It combines the perfect blend of multiplayer cooperation and competition. Once you complete the multiplayer game, you can unlock a new bonus dungeon. This bonus level is called The Palace of the Four Swords. You can also unlock a new side quest known as the Riddle Quest.A Link to the Past is highly recommended for any Game Boy Advance player who enjoyed classic Legend of Zelda games, like The Legend of Zelda: Twilight Princess and The Legend of Zelda: The Wind Waker. Rated "E" for Everyone, this game can be enjoyed by young children and adults alike. Whether you choose the solo or competitive play mode, you and your friends are sure to experience hours of fun, magic, and adventure. US $4.00 shipping for each additional eligible item you buy from nite_flite_time, when you use the cart to make your purchase. It's nice to play one of the old games at a leisurely pace without all the noise and constant tension that goes with the new games. Just a great way to relax while being entertained and working your brain. Another Great Zelda game, Fun and Addicting!! I Bought this game a few days ago, absalutly love it. PROS: cool graphics, great features, and very fun to play. lots of gameplay as well. if you die you don't have to start over, just from the last saved spot or beginning of dungeon. CONS: it's a little difficult, hard to avoid getting hit and losing life,you loose life fast, easy to die, takes some getting used to the menu and switching equipped items (like bombs, arrows, boomerang, etc.) i tryed the four swords part once, it was cool, but not as fun for me as the main game, and you have to have other people to play with to use four swords. Overall, i would highly recommend this great game to anyone who likes the zelda series, and to anyone who likes zelda-like rpg's. 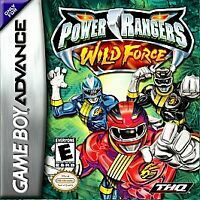 A great addition to your GBA library, and zelda series. The original SNES version kept us entertained for weeks and months, and the GBA port of "A Link to the Past" is a must, not only for nostalgia but because it is an excellent game, with good music, interesting dungeons, challenging puzzles and creative design. My only gripe with it is the addition of some voice clips, supposedly from the N64 game "Ocarina of Time" (also in the Zelda series), which can be somewhat annoying... think "HUUUAH" and "HUUUMPF" every 10 seconds, capable of driving any parent crazy. (-: I have not tried Four Swords, as it requires multiple cartridges, several Game Boy Advances and linking cables, whereas I only have one cartridge and a Nintendo DS. I should also mention that I bought an American release, and played it on a European DS Lite. Works like a charm with no problems whatsoever! 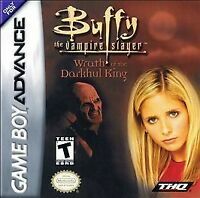 I got this game because my SNES stopped working and I was no longer able to play A Link to the Past. Now, they updated the classic game, and while the graphics and gameplay are the same as they are on the old Super Nintendo, they've added some things to it. Link, for example, makes sound when he swings his sword, and the names of the dungeons appears on screen when you enter them. 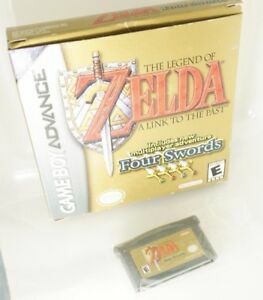 They've also added a side-game called Four Swords, which is multiplayer strictly, and I wasn't sure I'd ever get the chance to play since it requires each p;ayer to have a copy of the game, a GBA, and a link cable. However, I was lucky enough to have a friend with this game and a cable, so we were able ot play FOur Swords. It wasa lot of fun, and I hope Nintendo will release more good multiplayer Zelda games (not like the boring multi-player extras games included on the two DS Zeldas) Also added to A Link to the Past is a bonus level for once you've beat Vaati in the Four Swords game. It's a dungeon that takes place in what I believe is the Four Sword sanctuary, and so it links the storylines of the two games. While beating this dungeon is not nessary to beating Ganon and winning A Link to the Past, it is a cool idea. Even without the multiplayer option, this is a great game, and if you get the chance to play it with two or more people then you'll not be disappointed.